The wildflowers tickling the underside of solar panels on a site in Ramsey, Minnesota, are not just for decoration. They represent a new trend in photovoltaics: seeding industrial-sized solar power installations with native, pollinator-friendly plants, instead of using gravel or grass. Not only are the fields beautiful, but solar planners say the flowers lower maintenance costs over the 25-year lifespan of the array, reduce erosion by pulling rainwater deep into the soil, and provide important forage for wild pollinators and honeybees, which have been in steep decline the last few decades. Minnesota and Maryland recently passed laws to establish statewide standards for such habitats. Several other states—including Nebraska, North Carolina, South Carolina, Vermont, New York, Iowa, Wisconsin, Virginia, Michigan, Ohio, Illinois and Georgia—as well as a number of corporations and energy companies are moving forward with their own plans to seed pollinator-friendly habitats under arrays. “It’s simply more cost effective to establish an ecosystem of biodiverse, low-growing meadow grasses and flowers under and around the panels,” said Rob Davis of Fresh Energy, an independent, clean energy nonprofit based in St. Paul. Davis was instrumental in helping introduce the Minnesota and Maryland bills that became laws. The 1.3-acre array in Ramsey was one the first in the country to be fringed in bee-friendly plants. It belongs to power cooperative Connexus Energy, which began planning their 245 kW solar array in 2014. If the contracted engineers would have had their way, communications specialist Samantha Neral told Earther, they would have laid wood chips beneath the panels and called it a day. Instead, Neral and her coworkers hired Prairie Restoration to seed the land with flowers and prairie grass. Their field is one acre of roughly 2,300 acres of solar panels in Minnesota that support pollinators. They partnered with Bolton Bees and in the spring of 2017, situated 16 beehives around the field. Today their solar garden is awash in a rainbow of color from the purple prairie clover, black-eyed Susan, azure aster, upland goldenrod and wild bergamot, as well as dozens of other native grasses and flowers. The first batch of “Solar Honey” was drawn from the hives this fall and jars of it given away to the 131 co-op members. Neral hopes that electric cooperatives in Minnesota follow their lead. “We’re telling them about our pollinator-friendly habitat and hoping they’ll build the same thing,” said Neral. In hindsight, it’s a wonder no one thought to plant native, flowering plants under photovoltaic arrays. But in the early days of solar, some of the largest sites in the United States were erected by engineering firms accustomed to building utility-scale structures like substations and surrounding them with gravel. When they started designing solar power projects, engineers stayed with what they knew, clearing the land and laying down gravel or turf grass to keep things tidy. Not only were the contractors trying to keep maintenance costs down, they were trying to keep overall costs down. But gravel and grass aren’t cheaper, according to Gavin Meinschein, Senior Civil Engineer at Chicago-based SoCore Energy. He compared the costs of installation and maintenance for a native pollinator habitat to low-maintenance turf grass, standard turf grass and gravel. A prairie habitat with a mix of native grasses and flowering herbaceous plants, known as “forbs,” costs about $14,150 per acre over 25 years; standard turf grass costs $16,800; low-maintenance non-native turf grass costs $17,000; and gravel costs $25,000 per acre. “Once you get the native mixes and the forbs established it should really be minimal maintenance after the first three to four years,” said Meinschein. And the return of pollinators to a landscape otherwise wiped clear of flowers could benefit local farmers. Wild bees are twice as effective as managed honeybees at pollinating. A study from the Nature Conservancy, conducted in New Jersey between 2007 and 2011, showed that pollinator habitat located within two miles of certain crops improves yields. Squash and blueberries showed an 80% increase in yield, while other vegetables and fruits, such as tomatoes, peppers, cucumbers, watermelons, apples and peaches, had yield increases between 10 and 20%. 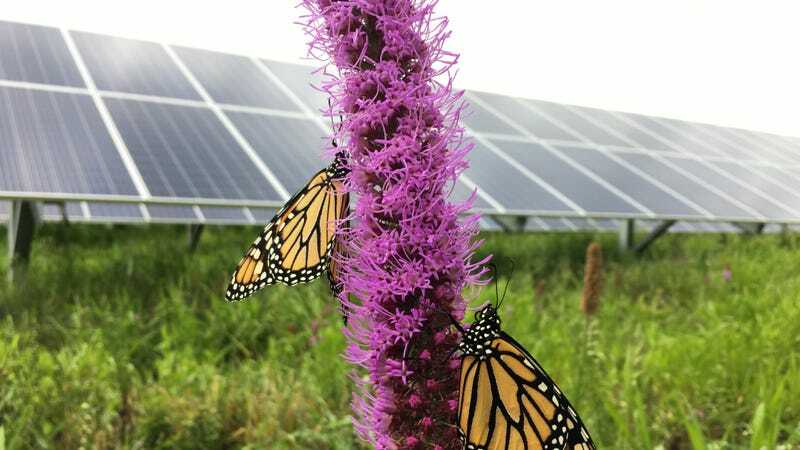 Despite the apparent benefits of turning solar farms into pollinator habitat, the laws in Minnesota and Maryland aren’t mandates. Instead, they’re encouraging solar power developers to do the right thing by giving them a score based on the habitat under the arrays. Seeding a field with diverse, native plants that grow for at least three seasons will garner a higher score. Points are subtracted if a solar field uses insecticide or is in close proximity to lands that use insecticide. Raindrop is concerned that although the laws in both states provide guidelines, they don’t contain language that specifically prohibits the use of insecticides that could become harmful to bees. With Maryland’s scorecard, she pointed out, it was possible to get a score that qualifies a site as “Meets Pollinator Standards,” even if pesticides were used. Introducing chemicals could happen unintentionally. For instance, some gardeners may not be aware that some wildflower and cover crop seeds are sold pre-coated in neonicotinoid pesticides, which research has shown can harm pollinators. “We have huge growth in the treated seed market,” said Raindrop. “It would be very easy to plant a poisoned pollinator habitat.” She recommends that growers, or anyone else wanting to plant a pollinator-friendly garden, consult the list of neonic-free nurseries published by Friends of the Earth. At the breezy wildflower garden in Ramsey, the bees feed on healthy forage. Prairie Restoration does not use seeds coated in neonics and doesn’t use pesticides, and the habitat gets a score that qualifies it as exceptional. And at the recommendation of the beekeepers from Bolton Bees, they’ve stopped spraying insecticides on the land surrounding the solar garden, too. The hives seem to be thriving. “We have happy bees,” said Neral.